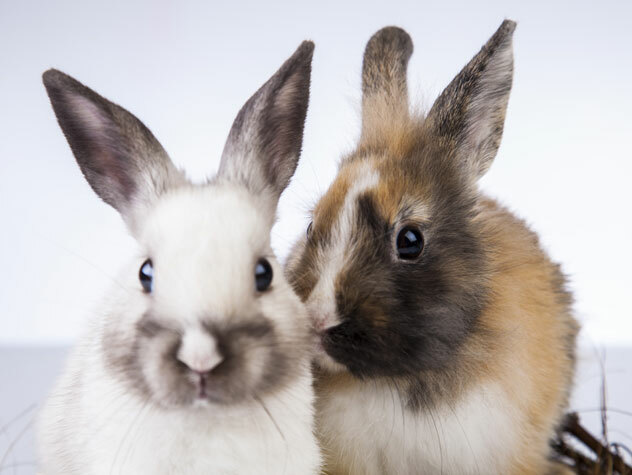 There are tens of thousands of rabbits waiting in shelters around the U.S., and even if it may not be the right time to adopt for you, there are still ways to help! Some rabbits end up waiting months, if not years, at shelters and there are several things you can do to increase their adoptability and improve their lives during their temporary stays. One of the easiest ways to help shelter rabbits is by collecting cardboard rolls and boxes, paper bags, and other items to donate as rabbit toys. Rabbits love chewing and tossing cardboard objects; stuffing hay, dried mint leaves, or one or two raisins inside makes the toy even better! It’s practically free and it can give a bored bunny hours of mental stimulation. Other useful items include old towels and blankets, which can be used to line cages, or old baby toys like plastic rings (avoid the teething kind though). Shelter workers and volunteers take dogs out for daily walks and play with cats, but rabbits are often overlooked in terms of exercise and socialization. This means they can end up stuck in small cages for months at a time with little opportunity to stretch their legs. Exercise is important for every aspect of health, and is especially important in terms of digestion for these hindgut fermenters. On a free weekend, head to your local shelter, set up some exercise pens and allow each rabbit to hop around for 20-30 minutes. Sit in the pen with them, let them sniff you, and occasionally pet them. This helps them get accustomed to interactions with people, so shy rabbits can slowly overcome their fears. A program was recently started at Purdue University School of Veterinary Medicine, where every Saturday two vet students go to the local humane society to socialize the rabbits for an hour or two. So far, the rabbits are absolutely loving the exercise and attention! Grocery stores and farmers’ markets are the perfect places to find many edible parts such as carrot, beet, and radish tops; the outer leaves of lettuces; and day-old vegetables that would normally be discarded. Most places will collect these parts for you, and all you have to do is deliver the goods to your local shelter, where the rabbits will gratefully accept them! 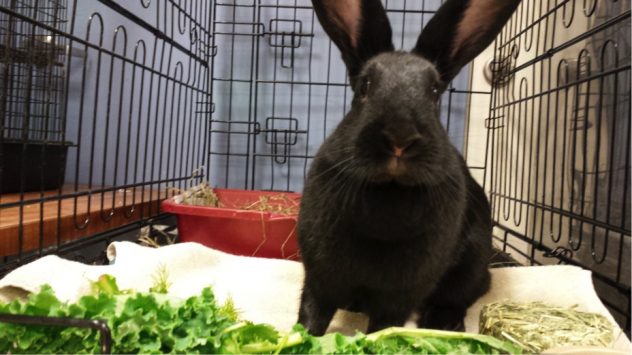 The fastest way to increase adoptions is posting cute pictures of available rabbits online. Petfinder allows the public direct access to available shelter animals, and adorable pictures with a winning description can hugely increase chances for adoption! A great picture is worth a thousand words, so practice your Paw-parazzi skills and share your photos on Petfinder and social media outlets like Facebook, Twitter, and Instagram. The next best thing to adoption is providing a temporary foster home. Fostering gives stressed-out rabbits the ability to recover psychologically, interact with humans and other pets in a safe environment, learn manners, and allow their true personalities to develop. Even the best shelters can be scary places for prey animals like rabbits, and allowing a bunny to come into your home is the best gift you can offer! Mary Lempert is a long time rabbit owner, foster parent, and licensed educator for the House Rabbit Society. Formerly, she worked as adoption counselor for the House Rabbit Network and as a rabbit behavior consultant to the Boston MSPCA. She’s the creator of www.therabbitadvocate.com and has written about the care and behavior of rabbits for newspapers, magazines, and online journals. She currently resides in Lafayette, Indiana, with her rabbits Graysie, Winthrop, and Oliver, and is in her third year of veterinary school at Purdue University. She plans on specializing in exotic animal medicine and surgery.